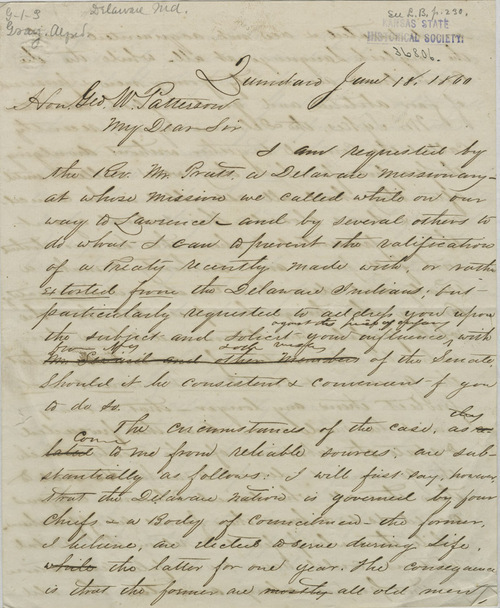 Gray wrote this draft of a letter to George W. Patterson concerning a treaty between the U. S. government and the Delaware Indians at the request of Rev. Pratt, a missionary to the tribe. Gray was concerned that the treaty was unfair to many of the Delaware and that the U.S. government was negotiating with four older chiefs, not some of the younger members of the tribe. He wrote that many of the Delaware were too intimidated to complain.